If you are texting or engaged in a cell phone discussion with someone you know is driving, should you share legal accountability if there is a crash? 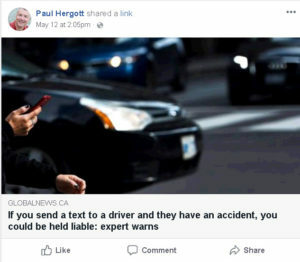 In a recent news story, an insurance and legal expert pointed to a New Jersey court ruling from 2013 where that possibility was considered, in the context of texting. I posted the news story on Facebook. Goodness, the negative responses! Most of the responders, I believe, were envisioning scenarios where they would have no way of knowing that the person they were texting was driving. Or that a driver would make the stupid choice to read and / or respond while continuing to drive. But let’s assume that you know. Twenty-five seconds after you send a text, the driver texts a response. Seventeen seconds later, the driver initiates a 911 call. Leaving time for the driver to stop the vehicle and observe the injuries he reported to the 911 operator, the crash must have occurred immediately after he hit “send”. The driver had crossed the centre line, crashing into an oncoming motorcycle. The driver and passenger of the motorcycle each lose their left legs as a result of the crash. This is the true story told in the 2013 New Jersey court decision, which you can access through this hyperlink. The evidence fell short of proving that the girlfriend knew her boyfriend driver would be responding to her text while driving. But the court made it clear that had the evidence proved that point, the court would have imposed a shared legal accountability on her. I will do my best to help you understand the reasoning of the court, but please read the decision for yourself because I cannot not come close to doing it justice in a few paragraphs. The court used a passenger as an analogy to a remote texter. Obviously, a passenger must not actively distract the driver. The court used an example of suddenly holding a piece of paper in front of the driver’s face and urging him to read it, or holding a cell phone with a text message or picture on it in front of the driver’s eyes. That, of course, is not what occurs when you send a text message. The cell phone doesn’t leap up in front of the driver’s eyes, blocking his view of the road. The court considered whether passenger liability could extend to urging the driver to take his eyes off the road to look at a distracting object. Extending the driver’s “primary responsibility” to the texting situation, the court noted that the sender of a text message should be able to assume that the recipient will read it only when it is safe and legal to do so, i.e. when not operating a vehicle. Would a British Columbia court come to a similar conclusion? Would that conclusion extend beyond texting, to include cell phone discussions? I can usually tell when the person I’m talking to is driving. And I terminate the discussion. Do you? If a crash occurs while you are engaged in a text or cell phone discussion with the responsible driver, will you feel responsible? I think you should. And I think you should share legal accountability as well. But you won’t be covered by the driver’s insurance. Are you prepared to risk losing your life savings over a cell phone discussion or text exchange?